Joe Nickell continues his investigation of Scottish enigmas—based in part on his excursion following the 2012 skeptics QED conference in England, with intrepid skeptical investigator Hayley Stevens and her father Andy, who is a photographer and professional guide. The famous “Mansi photo” of the Lake Champlain monster has been held up for decades as strong proof for cryptozoology—the so-called best evidence for the existence of a hidden animal. Yet, newly uncovered documents reveal troubling questions about the photo and the circumstances surrounding it. What causes the startling, unbidden perception of something that seems very real but has no material existence outside of our own minds? 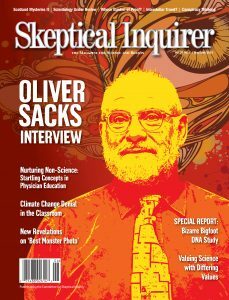 The “poet-laureate of medicine,” Oliver Sacks, takes us through the looking glass and into the fascinating world of hallucinations. What do you do when your heart says one thing and the data says another? When science conflicts with values, which wins the battle for your soul? Which, for that matter, gets your vote? What a privilege to be living through a time of such miracles. These are not literal miracles, of course, in the sense of divine intervention, and so miracles is not the correct word. We very likely have Katie Holmes to thank for the timing of this latest crop of books on Scientology, the belief system so notably promoted by her ex-husband, Tom Cruise. Yes, at least two of these authors have been researching their books for many years, but for promotional opportunities you can’t beat a good celebrity crack-up.